Each summer, Indianapolis hosts Gen Con: An annual gaming convention where players, authors and more meetup for what the organizers call “the best four days in gaming.” The city is also home to Sun King Brewery and the outfit is well-known in the area and around the country for award-winning brews like Sunlight Cream Ale, Wee Mac Scottish-Style Ale, Cherry Busey and many more. Each year, Sun King partners with the convention to make a unique beer and attendees get the chance to vote on its name. For the 2016 installment, the name was actually voted on before the style or finer details of the beer were selected by the brewers. 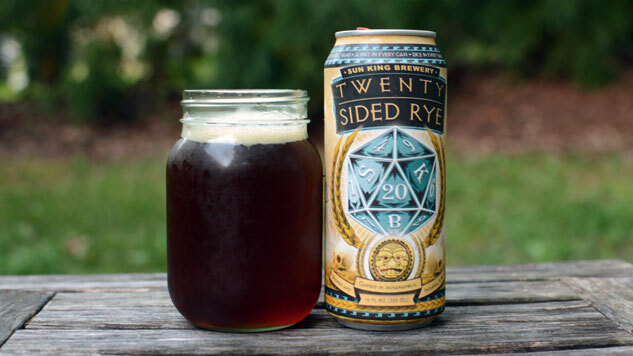 Gen Con 2016’s beer is called Twenty-Sided Rye, a nod to the 20-sided dice that Dungeons & Dragons players are quite familiar with. As you might expect, rye factored into the grain bill of what is actually a Roggenbier. If you’re not familiar with the style, it’s a medieval German ale that’s traditionally brewed with half barley malt and equal portions wheat and rye. The medieval roots of the beer no doubt factored into the decision-making process when the folks at Sun King were deciding on a recipe. Twenty-Sided Rye pours a rich amber color with a thick creamy head that fades to a ring around the outside of the glass. That ring never totally disappears and there’s a thin layer on the top of the beer that remains as well. The nose is packed full of malty sweetness with a touch of rye spice. It’s an aroma not unlike the Oktoberfest-style brews I’ve been drinking a lot of over the past few weeks. The taste follows the nose a bit, but the the rye is much more prominent in the overall flavor. There’s not as much spice as a straight rye beer exhibits, but there’s enough here to make its presence known. Overall, Twenty-Sided Rye drinks like a full-flavored and full-bodied amber ale. Sure, there’s some spicy rye character, but there’s also a solid dose of the malty sweetness an amber typically exhibits. I’m a big rye fan — beer and whiskey — so I was hoping for a little bit more of those flavors coming through. Don’t get me wrong, this is a solid beer, and I’m sure the folks at Gen Con were happy to take it down by the pint. To me, Twenty-Sided Rye was a more complex amber ale and one that’s very flavorful for a beer clocking in at under 6%. Now that I know Sun King brews a new beer for the event each year, I’m eager to see what next year’s installment holds. 2017 is the 50th anniversary of the event, and I’m told Sun King is planning something “golden” for the occasion.